Meet Defense Distributed, home of the Wiki Weapon — "A collaborative project to create freely available plans for 3D printable guns." They've just been granted $20,000 in funding from an angel investor. As outlined in an explanatory Youtube video, Defense Dist. 's goal is not to arm the populace, but to liberate information. As explained in their video, if the instructions for 3D printed gun are seeded online, then "any bullet becomes a weapon." It's good that open-source information is Defense Distributed's major goal, because Stratsys, the company that makes the 3D printer used by Defense Dist., seized the printer from Cody Wilson. Producing a whole weapon, claimed Stratsys, would break laws against home weapons manufacturing. In July, Extreme Tech reported on a user named HaveBlue from the AR-15 forum. HaveBlue used a mid-90s era Stratasys brand 3D printer to make the body of a .22-caliber pistol. HaveBlue's creation utilized a commercial chamber fused with a 3D-printed body. Said HaveBlue: "It's had over 200 rounds of .22 through it so far and runs great!" HaveBlue went on to remind readers that manufacturers have been using 3D printing for modeling and design purposes for a while. 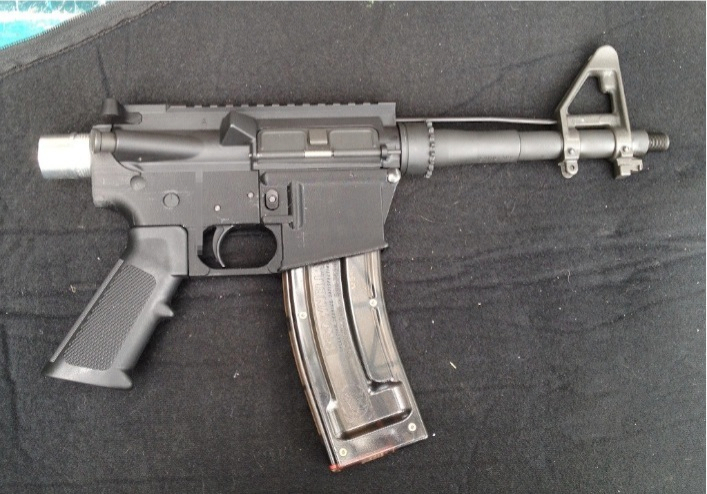 His gun was simply the first with 3D printed plastic parts to be tested by someone at home. Anab Jain of Superflux told the magazine Dezeen that Defense Dist. is a symptom of the transforming dynamic between consumers and manufacturers: “The old rules and regulations about who is the designer, who is the manufacturer and who is the distributor change when people have the tools and opportunities to become the designer, manufacturer and distributor themselves." It's all too easy to imagine a future where rebels or criminals rely on 3D printing to produce weapons cache. While we haven't arrived there yet, ours is certainly an era of infinite reproducibility available on an increasingly smaller scale. In the future, it will likely be not only the legality of home weapons manufacturing but also questions of copywrite that will come to define this issue. Now that the idea is born, taking away the tech is only a minor snag. God help us, but printing of firearms is just the tip of the iceberg. de-professionalize/ decentralize their production of narcotics; and of course the doomsday application would be a catalyst-box for aspiring terrorists. By which logic: If in the year 2030, any fool with a grudge and an off-the-shelf 3D printer can access templates which will quickly and consistently manufacture a mass-attack weapon– THEN we can expect the state to exponentially expand its powers of internet "snooping", with an accompanied expansion of its system of "arbitrary arrest and execution", in order for the state to regain the initiative against "terror plots". In this scenario everybody loses: the developed/"democratic" nations would become less free, to counter the threat posed by "auto-template" weaponry; meanwhile, large portions of the developing world would be unable to regulate this new technology, leading to an even greater proliferation of mass-attack weapons– imagine a world in which every frustrated and/or desperate young man, momentarily held in the sway of an apocalyptic ideology, has the ability to quickly assemble a powerful explosive device from an easily accessible and anonymously hosted template. turn-out to be a failure! Because as cool as it might be to print customized ceramics and individual prescriptions of antacids in my living room, it's neither worth having Big Brother coming to live/sleep on my couch forever, or else being blown to smithereens by a psychotic having a bad self-esteem day. Well, actually, this is nothing new – See the "Anarchist's Cookbook". (1971) A reaction from the Hackerspace Community to the Wiki Weapon is, "You just have to count on you neighbors being excellent." Yes, Statism is a problem. But, so also is privatization of functions which should rightly be carried out by the State. There should be no private armies. In a government by, for and of the People, State Secrets are profoundly immoral. So is Government land with a "No Trespassing" sign. That land belongs to the People. Corporate secrets kill competition. The most important thing about democratized 3D printing is open-sourcing the knowledge to build things. How about mental-health care for the psychotic? Have you been excellent to your neighbor lately? I might add, the primary problem on this page might be PARANOIA. Who is going to protect you from WHOM? Who is the "enemy" anyway? agreed that fundamental problem of civilization is the same– knowledge can be used for good or for ill, and "–can't we all just get along"– but sometimes the "tech" has a trajectory of its own, and let's face it, as human beings we are still struggling to get our individual and collective minds around the physical principles of high-explosives. and although the anarchist cookbook has led an interesting life in our culture, the fact remains that advanced bomb-making requires a great deal of skill, and a certain degree of apprenticeship/professionalism– thankfully! this being the main reason that so many terrorist plots have been duds. the hypothetical danger in the availability of automated templates for "chemical labs on a chip" would be to lower this skill/professionalism threshold– and yes, this would be a major problem. who is going to protect whom from whom? well, having lived in the Middle East, specifically Saudi Arabia, I could introduce you to various parties who will openly state their desire, and long-term intention, to attack ethnic and/or religious groups which they perceive to be antagonistic to themselves– and so I'd venture that it's not about "enemies" in any abstract sense, it's about individuals and groups who perceive themselves to be in a state of existential conflict, and who will avail themselves of the available means to pursue this conflict. as per paranoia: to quote a soldier i used to know, "–it's not paranoia if they really are out to get you." and sadly, yes, many human beings, psychotic or otherwise, desperate or otherwise, are genuinely out to "get" one another.